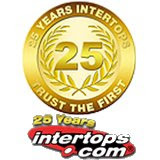 It’s been twenty-five years since Intertops took their very first wager and this month they begin a yearlong birthday celebration with a free $25,000 March Madness Bracket. All through the silver anniversary year, the site that started it all in online gambling in 1996 will be giving away trips to major sporting events including Super Bowl XLIII, the NFL game in London, the MLB All Star Game, the tennis US Open, the PGA Championship, the BCS Championship and the NCAAB 2009 final plus NHL season tickets. The free March Madness Bracket is the first special offer in the anniversary celebrations. The challenge is to pick the winner in all 63 NCAA Men's Division I Basketball Championship games. The prize is $25,000 and tickets to the Final Four 2009. If more than one punter picks all 63 correctly, the cash prize will be split and the tickets will be allocated by draw. Even if nobody picks the perfect bracket, the full $25,000 will still be awarded and split between those with the most correct picks. In keeping with the “25” theme, Intertops is also giving two special 25% bonuses on deposits made between March 17th and 23rd and ahead of the Final Four tournament between April 5th and 7th – that means up to a total of $500 free money. As always, Intertops welcomes American players to their online casino, poker room and sportsbook.